First Appearance: Justice League of America (vol. 1) #75 (Nov. 1969): "In Each Man There Is a Demon"
In Wonder Woman #34, Black Canary's friend Wonder Woman asked her directly if she is a Christian (to confirm what Wonder Woman already knew). 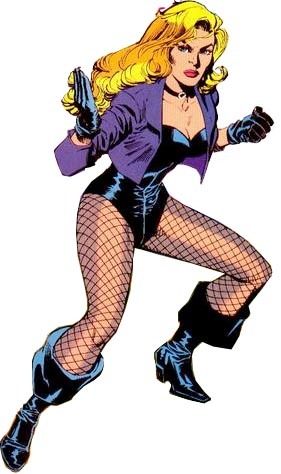 Black Canary answered, "Yeah. I mean, it's complicated, but sure." 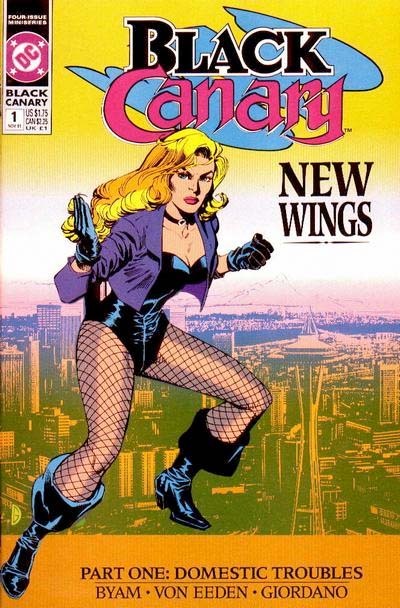 There is little indication within her large body of published comic book stories, film and television appearances to indicate that Black Canary is an active churchgoer or in any way unusually devout. 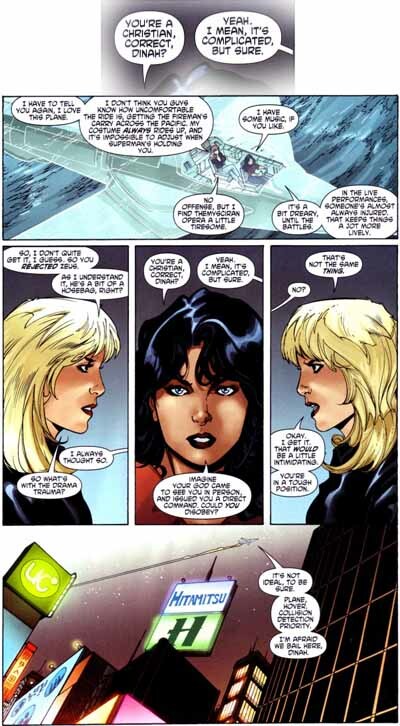 Her religious affiliation has never been a significant part of her character in the same way (for example) that it is for some of her friends and teammates, such as Wonder Woman, Huntress and Martian Manhunter. But nor are we aware of her exhibiting any indications of particular irreligiosity, unorthodoxy, or deviation from general societal norms for a contemporary American who is at least vaguely or nominally Christian. Action Comics (vol. 1) #421 (Feb. 1973): "The Headline Maker!" Birds of Prey - Season 1, Episode 0 (2 Oct. 2002): "Unaired Pilot"
Birds of Prey - Season 1, Episode 1 (9 Oct. 2002): "Pilot"
Birds of Prey - Season 1, Episode 2 (16 Oct. 2002): "Slick"
Birds of Prey - Season 1, Episode 3 (23 Oct. 2002): "Prey for the Hunter"
Birds of Prey - Season 1, Episode 4 (30 Oct. 2002): "Three Birds and a Baby"
Birds of Prey - Season 1, Episode 5 (6 Nov. 2002): "Sins of the Mother"
Birds of Prey - Season 1, Episode 6 (13 Nov. 2002): "Primal Scream"
Birds of Prey - Season 1, Episode 7 (20 Nov. 2002): "Split"
Birds of Prey - Season 1, Episode 8 (27 Nov. 2002): "Lady Shiva"
Birds of Prey - Season 1, Episode 9 (18 Dec. 2002): "Nature of the Beast"
Birds of Prey - Season 1, Episode 10 (8 Jan. 2003): "Gladiatrix"
Birds of Prey - Season 1, Episode 11 (8 Jan. 2003): "Reunion"
Birds of Prey - Season 1, Episode 12 (19 Feb. 2003): "Feat of Clay"
Birds of Prey - Season 1, Episode 13 (19 Feb. 2003): "Devil's Eyes"
Body Doubles #2 (Nov. 1999): "Hot Water"
Green Arrow (vol. 3) #40 (Sep. 2004): "New Blood, Part One: Moving Day"
Green Arrow: The Longbow Hunters #1 (Aug. 1987): "The Hunters"
Green Arrow: The Longbow Hunters #2 (Sep. 1987): "Dragon Hunt"
Green Arrow: The Longbow Hunters #3 (Oct. 1987): "Tracking Snow"
Green Lantern (vol. 2) #100 (Jan. 1978): "Beware the Blazing Inferno"
The Joker #4 (Nov.-Dec. 1975): "A Gold Star for the Joker"
Justice League of America (vol. 2) #16 (Feb. 2008): "A Brief Tangent"
Justice League of America (vol. 2) #32 (June 2009): "Welcome to Sundown Town, Chapter 4: Nyctophobia"